Pet obesity and human obesity are both serious problems and need to be dealt with. We hear a lot about human obesity but little about our four legged friends. The same problems that relate to human obesity also affect pet obesity. If your pet is overweight you should be very concerned. Please use the Chihuahua Calorie Counter on this page. It's a great FREE tool offered by www.trainpetdog.com. The sad fact is that almost a quarter of our pets are actually overweight. So why is this happening? Some think it correlates with the electronic age and the lack of time we all have for our pets. We tend to take a lot of shortcuts these days. Remote controls, microwaves, dishwashers and computers, all are meant to make our lives easier. These things meant to make our lives easier, leaving us more time for things like walking the dog often do not, unfortunately. Sure, our tasks can be completed quickly, but even then people are finding other things to fill their time with. People spend hours on the Internet or in front of the TV screen instead of getting outside and walking the dog. It is a sad shame that people can’t find pleasure in the simple things anymore. Our pets are suffering, which is probably a direct cause of our own sedentary lifestyles and the growing obesity problems associated with it. People are even moving into more urban areas with less room for dogs to run around. Another reason for Pet Obesity is over-processed pet foods. Many pet owners also feed their dogs unhealthy scraps thinking it will not hurt. We have complete control over our pets’ diet, since they rely entirely on us as to what they eat and when. You must take action if your pet is overweight. If obesity is left unchecked your dog may develop other more serious and costly complications; or worse yet will die at an early age. 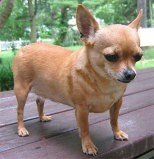 The Toy Breeds such as the Chihuahua are the ones most susceptible to obesity, because of their size we tend to baby them more. You’ve heard the expression “Pocket Chihuahua”; while many are small enough to carry around in your pocket or purse they need exercise as well. As the Toy breeds are generally always underfoot, or in our laps, we tend to give them more treats and scraps than the larger outdoor breeds. After all if you’re treating yourself how can you deny them part of it; Right? If you suspect your dog is overweight take him to a vet’s office. They can set you up with an exercise plan and diet. You might find you’ve contributed to your dog’s weight problem by doing some things wrong. The exercise plan may very well benefit the whole family as well. No matter how busy your schedules make sure you’re not too busy to spend time with your pet. Your dog will be a lot happier and healthier if you feed him the right things and take the time to do some healthy exercise.